Numberlys [$5.99] is an interactive story from Moonbot Studios, which is promoted as a story, mystery and game. It started out as a short film, but when the iPad was announced they changed direction and eventually created this lovely visual experience for us to enjoy. We don’t usually review interactive stories or children’s games, but Numberlys caught our eye due to it’s stylish artistic quality …and, for the record, it does include mini-games. 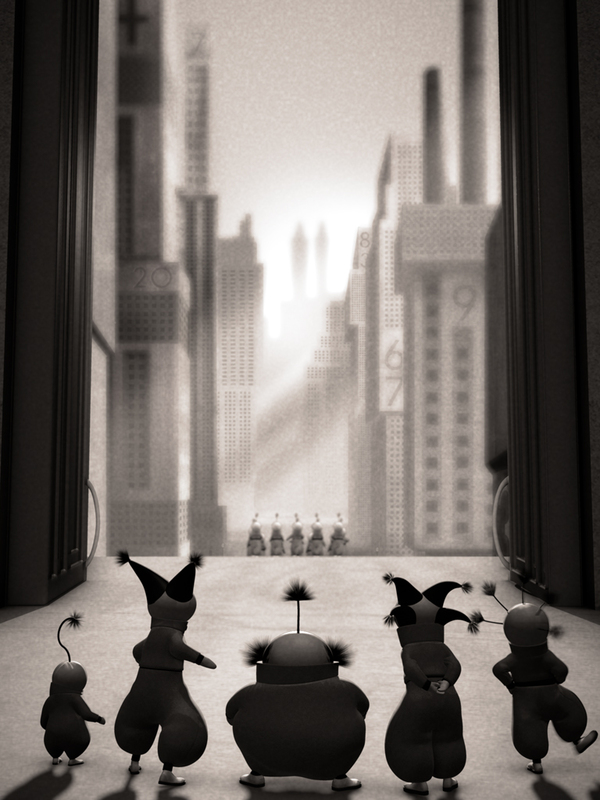 In a colorless world filled with numbers, five of the citizens wanted a change and set about inventing the alphabet. The story is told through beautiful black and white animated graphics which are clearly inspired by the classic sci-fi film Metropolis, but with a modern touch. It’s a children’s story, but adults can enjoy the wonderful presentation, music and sound effects. 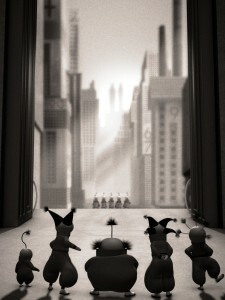 Text cut-scenes are displayed, like old-fashioned subtitles (just like Metropolis) and the story is also conveyed verbally by a narrator, who has the perfect voice and accent for this particular tale. 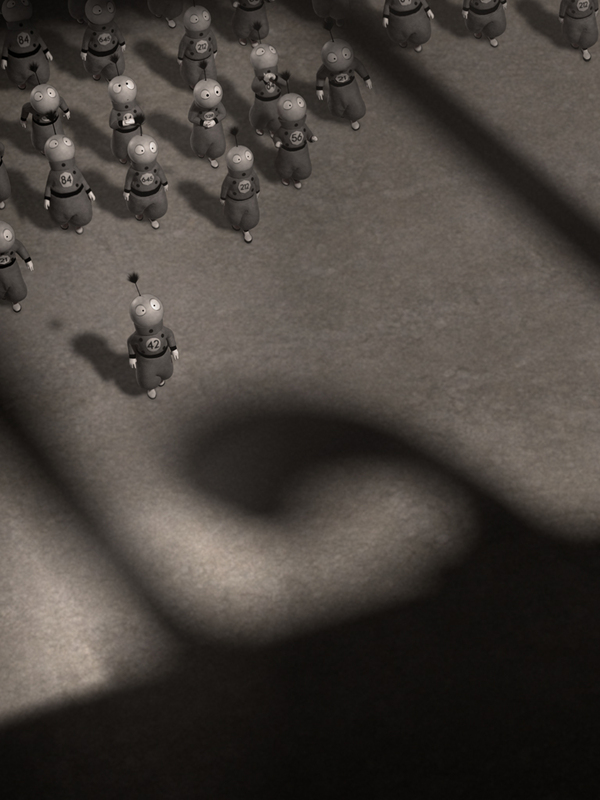 During the animated film, items appear in red if they’re interactive. For example, touching a red light-bulb above a character will make them say their line. Or pressing a red button might trigger the next piece of animation. Sometimes you turn or swipe an object, to help construct the next letter of the alphabet. There’s only one pathway through the story, so your actions don’t really change the outcome. However, although the interactive component is limited, it does help you to feel involved. There are eighteen “mini-games" to play, like tapping the five main characters to create the “ayyyyy" sound of the letter “A", but there’s no passing, failing or scores (which was an intentional design decision). It’s more about interacting with the characters and story world. The mini-games are easy and can generally be completed within a minute, but again, they’re not intended to be challenging or drawn out. It’s more about the experience. Other mini-games include brick-breaker and whack-a-mole variants and aim-and-shoot games, which all sounds quite cheesy, but they’re actually presented with a stylish quality that’s consistent with the rest of the app. Although, some of the mini-games are repeated, with the jumping game appearing a few times. I watched Numberlys in a quiet room, on a comfy couch and enjoyed the 28 scenes within an hour. Afterwards I watched some of their behind-the-scenes footage, from which it’s clear the development team are proud of their work. I’ve enjoyed and savored Numberlys, but like any film, I probably won’t watch it again for a while, but it could be a recurring treat for a young child.